Thank you Simon and Nonho for these encouraging words - largely appreciated and which I send back to you and to all contributors who’s honest and honorable journalistic research aims to better understand this confusing world of ours. aa5 » June 11th, 2017, 4:31 pm wrote: One question I have is if these 'attacks' made all these people stronger, smarter and happier people.. then why do they need state compensation? That's an excellent observation, aa5 - France's unique yet murky 'terror victim State compensation fund’ is financed by what is popularly known as the terror tax, a €6.50 yearly contribution levied on all auto, home, and life-insurance policies. With 86 million insurance policies in France, that makes up a lot of dough, and a vast nation of fools (including yours truly). The terror victim compensation fund is called the FGTI (the Fonds de garantie des victimes des actes de terrorisme et d'autres infractions - Guarantee fund for victims of terrorist and other criminal acts), established initially in 1986 as the Fonds Terrorisme (Terrorism Fund). In 1990 terror victims were given the status of war casualties in French law. The FGTI aims to offer ‘full compensation’ to terror victims and includes graded payments for physical as well as psychological wounds (for example terror-related anxiety). This fund is unique in the world. Israel, for example, only reimburses medical expenses while in the English-speaking world terror victims are aided through public donation programs alone. How much money can a victim expect to receive ? Payment gradients are also calculated based on loss of professional work income and offer payments to victims’ families (for example a mother who lost a son may receive up to €45,000). Well they certainly are thinking ahead, with 1.2 billion Euros they must be building up a fund.. at 5% return a year that fund would already be able to pay 60 million Euros a year in compensation. In addition 86 million insurance policies * 6.50 Euros = ~550 million Euros annual levy. Since it started 3 decades ago I would have to say they have been quite prolific in paying out already. (Unless the annual levy markedly increased in recent years). If there was that fund in an Anglo-Saxon country, 90% of people within a 20 mile radius of the terrorist attack would be traumatized and unable to work for life. ^^^^^ the annual levy has been increased several times in recent years. The FTGI fund recognizes (since 2017) two new terror-attack related victim conditions termed situational anxiety prejudices defined for the direct victim as « an acute feeling of distress » caused by « the awareness of one’s own mortality when faced with imminent death » and of « the feeling of anguish and uncertainty as to the victim’s fate » in the case of close family members. Anyone who was present in the close vicinity of an attack who suffers from forms of post-stress or anxiety can now claim compensation. You can download the two claim forms on the Terror Fund’s website. Complete and mail the forms to the listed address to make a claim. The FGTI website insists « provisional payments » will be transferred to the victim’s bank account within three months of date of mailing. Claimants need not be French nationals but must have been present at the location of the terror attack. Claimants also have up to ten (10) years to submit a claim starting from the date the attack occurred. Ms Z., 29 years-old : kidnapped and sequestered as a hostage abroad : €140,000. More smiling memes in random witness testimonies from survivors of the 13 November 2015 Paris massacres. It reminds me of the car insurance industry that has grown so much. With the great advances in the last few decades in car safety and roadway designs, there has been a very substantial decline in the number of people who are killed or seriously wounded(like needing ER treatment) in car accidents. But the payments for people involved in accidents keeps rising. There is a whole industry of lawyers, doctors, insurance estimators, negotiators who make their living in this new industry. While it might seem that the insurers are on the side of limiting damages, in the long run they are on the side of increasing payouts. More and bigger payouts means people need to carry more insurance, thus pay the insurance companies more money to insure against greater financial risks. The people who are employed in this FGTI will want raises, promotions, a bigger and more prominent head office building, new jobs to set up their friends in, and so forth. CitronBleu » 13 Jun 2017, 03:37 wrote: ^^^^^ the annual levy has been increased several times in recent years. I got in touch back then with the president of the italian association of victims of terrorism; on their website is a list of the legislative measures in favor of the relatives of the victims, including pension and tax privileges. This package might be there as a reward to the people we see smiling on the news, as they act out the part of relatives of terror... but in my opinion this is not necessarily the case. The money either is never given out, or it is channeled to fund more fakery. Never forget that all these people are nothing but agents/actors, chumps who obey orders and retire early in privilege, yes -- but I don't see them at the core of the conspiracy, handling the money trails... they are just useful idiots. If I reread what I wrote back then I must say that my approach was really animated by incredible naivety considering that I actually believed the guy in that seat could have been legit. Nothing came out of that, as the president of AVITER dropped out of sight... only leaving us with the incredible statement that the U.S. government had forbidden to the Italian government to broadcast the names of the 10+27 (or whatever number) of Italians killed on 9/11. To this day the number and the list of names are unclear. Actually about this there's been a development, more on this on the other thread. I am not sure how to go about this story : how do we fit a criminal conviction for posing as a terror victim with the general suspicion of media fakery, which must surely involve the judicial system itself ? Was Cedric Rey a deranged impostor who chose to pretend to be a terror victim/witness and succeeded in integrating himself into the purported terror victim community ? or were other factors at work ? Cédric Rey offered many details to the media about his ordeal in the days following the 13 November attack (including to such news agencies as Le Monde, Libération, Le Parisien, BFM-TV, and Agence France-Presse), in taped interviews in front of the Bataclan as well as at his home (a three-hour interview given to Libération of which only segments are available online), and on Facebook. According to Rey’s testimony, the paramedic had been drinking a half-pint of Carslburg beer at the Bataclan’s terrace with two friends when the attack occurred. For two nights « they circled the surrounding area like zombies, lighting candles everywhere. » Rey later began to attend victims’ group associations. Rey had himself tattooed a Marianne (symbolizing France) with a blood tear on a background depicting the Bataclan, in a gesture imitating several other victims/witnesses, was active in victims’ groups (such as Life for Paris), hosted survivors in his home and even attended « therapy cocktail hours » in Paris pubs. Rey discussed applying pressure to the injured man’s wound outside the concert hall : « when I lifted my head, I saw a guy in front of the entrance of the Bataclan turn around … his Kalashnikov was slung across his shoulder and it was pointed at me - at that very moment, a woman crossed between us, running: she took the bullets. » Rey described the women as pregnant, a detail which he claimed came back to haunt him. These strange terror-related media incidents are not new. 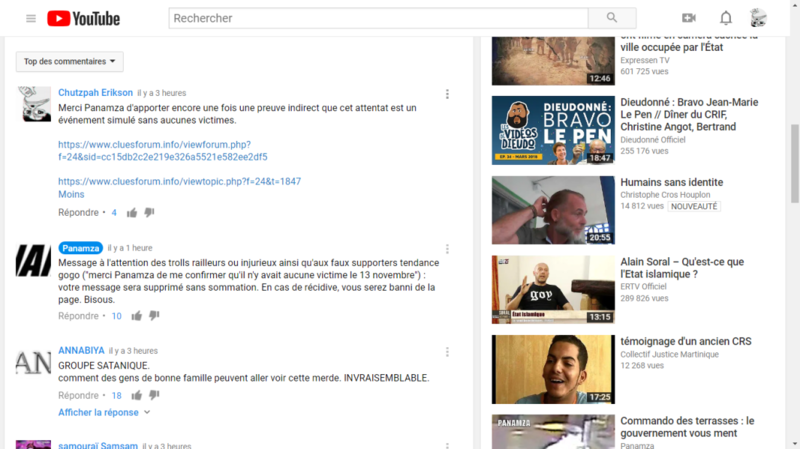 In an earlier post I discussed the case of alleged 2016 Nice Bastille attack terror victim Timothé Fournier, initially revealed by the AFP news agency and later exposed by the same media to be entirely fabricated (leading the AFP director for information, Michèle Léridon, to issue a public apology while claiming the misidentification was caused by sloppy journalism). Another bizarre case, also concerning the Nice Bastille attack, was that of alleged ex-attorney Corentin Delobel to the terrorist perpetrator Lahouaiej-Bouhlel. Delobel appeared in several taped media interviews in the days following the attack claiming he had been the perpetrator’s attorney before Delobel was exposed as never having met Lahouaiej. A recent case, connected to the 2015 Bataclan attack, is that of Dany Machado who, a few days ago on France’s La France a un incroyable talent, a TV singing talent show followed by millions, composed and performed a song about « his friend Alexandre killed in the Bataclan attack. » In the days following the 23 November show, Dany Machado’s friend ‘Alexandre’ was revealed to have never existed and to be a complete fabrication out of Machado’s prolific imagination. Dany Machado’s compelling yet mendacious performance can be watched and listened to in the below video, segment 54:35-01:01:40, amid tears and the expression of unbridled grief (and a standing ovation at 59:25). There have also been (expected) attempts to obtain money from the terrorism fund by other individuals trying to pass off as false witnesses/victims, nevertheless none to the extent of Cédric Rey who appeared continuously in the media and participated in victims’ associations. If you replaced in the above quote listed in red at the top of the post the word ‘victim’ with that of ‘witness’ (which is what these individuals ought to be considered), then the meaning of the quote becomes clear : the function of testimonial evidence is meant to be questioned ; that of witness suffering is not. The blurring of the lines between the two result in the impossibility to question and thus, in term, to seek justice. The "freelance" journalist who keeps you in the idea that the attacks are engineered, but with real victims. We all know it here, in every event manufactured, there are the official versions and the alternative versions for recalcitrant people. 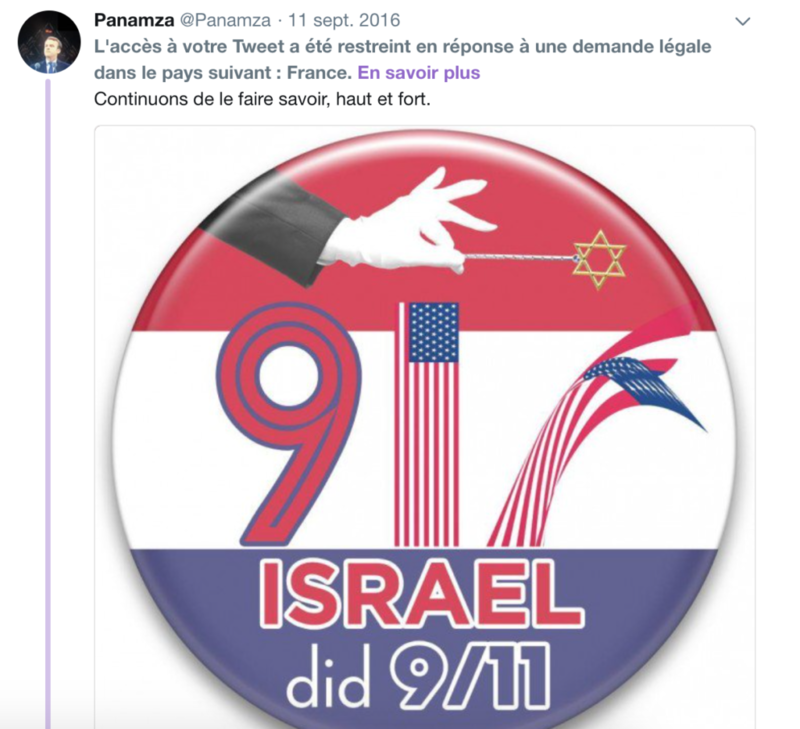 Panamza (of his real name "Hicham Hamza") is the first source of information in France to quickly denounce the official version with its many scoops and other “revelations”. He did the work for the Merah case in 2012, Charlie Hebdo in 2015, Paris on November 13, 2015, and the Nice “attack” in 2016. But he still continues to publish articles to signal the presence of such a Zionist Jew in such a place. Its role is to designate Israel behind each attack as the first sponsor. It even goes until September 11. "Israel did 9/11" as he often repeats. "Israel and September 11: The Secret Connection." How does it work? Very often he will reveal that the first publication of an image for an attack comes from an Israeli source, that the one who filmed by example the truck in Nice is the husband of a female Mossad officer etc.. I think that all this alternative version accusing Israel is created even before the event in question. The funny thing is that all this tends to rejoint the official version. Arab terrorists did kill people in the Bataclan, didn't they? Yes, but they were being manipulated. The suicide bombers were indeed Arabs? Yes, but we remotely activated their explosive belts. Panamza doesn't really lie. What he says is generally verifiable. But he never questioned the reality of the victims. In July 2018, he posted a video entitled "the photo shock of the bataclan was rigged". In this video he claims that it is false because an element in the photo tends to prove that this photo could only have been taken before the November 13. It's a weak demonsration, isn't it? The bright red blood? The lack of blood on the clothes? No drinks on the track? All bulbs intact etc. Not a word about it. In case of doubt, I thank Panamza with this comment. Look at his reaction. Me: Thank you Panamza for once again providing indirect proof that this attack is a simulated event with no victims. I posted a video for denounce him. You can see the negative comments. Thank you for your very pertinent post : I think you are absolutely correct regarding Panamza. Guilt by association is one of the oldest tricks in the propaganda bag. Systematically associating anti-semitism with the legitimate criticism of the State, and of its power structure, serves the interests of those one affects to expose - surely lying and treachery mustn't solely belong to one human ethnic group alone. Slight correction Citronbleu, it's NOT the "anti-semitism" of Panamza that is being criticized. The problem rightly being criticized is: Panamza claiming "real Victims" died in these attacks. Panamza (due to ignorance or inexcusable malice) deleted TErikson's "Victims fake" comment. No need to bring up "anti-semitism" on this thread. The point above is about: Vicsim propping. Too bad: before you posted that I was planning to praise your VISUAL screen-grab posts on this thread. Your strawman was, "surely lying and treachery mustn't solely belong to one human ethnic group alone." As if anyone said, "lying and treachery solely belongs to one human ethnic group alone." Total strawman. In my opinion, your Strawman post was not pertinent to the Vicsim-propping problem TErikson posted. Your "the problem is criticizing Jewish actions" post, and my reply here, should be moved to Derailing. Hi Observer, and thanks for pointing that out. Observer » November 16th, 2018, 11:40 am wrote: I have to correct your not-very-pertinent "criticizing Jews is a pyop, others are guilty too" post. However If you look back to my post, I wrote "Systematically associating anti-semitism" : I am in no way against identifying blame and responsibility to individuals or governments. "Its [Panamza's] role is to designate Israel behind each attack as the first sponsor. It even goes until September 11. "Israel did 9/11" as he often repeats. "Israel and September 11: The Secret Connection." Though I wholly agree with you the poster's main argument is about the nature of mass terror-related media testimony, TErikson also discusses responsibility. CitronBleu wrote: surely lying and treachery mustn't solely belong to one human ethnic group alone. Did someone (for example this Vicsim-propper Panamza specifically, or imagined 'anti-semites' in general) actually state or even imply the sentence you were tearing apart strawman-style: "Lying and treachery solely belongs to one human ethnic group alone." In general, if somebody actually said or implied "solely/all/100%", then refutations such as "NOT solely", "NOT all", "NOT 100%" are perfectly fine replies to that inherently wrong statement/implication. In general, if nobody actually said or implied "solely/all/100%", then refutations such as "NOT solely", "NOT all", "NOT 100%" are by definition building up a weak strawman that is easy to tear apart. A statement like "100% of Jews are committing lying and treachery" would of course be false, and easily be torn apart. A statement like "100% of lying and treachery is being committed by the Jews!" would of course be false, and easily be torn apart. That is the kind of nobody-is-actually-making statement which I have seen "anti-antisemites" building-up and then easily "righteously" tearing-apart. A disproportionately high percentage of my fellow Jews are committing lying and treachery. A disproportionately high percentage of lying and treachery is being committed by my fellow Jews. A disproportionately high percentage of my fellow Jews refuse to honestly criticize the lying and treachery being committed by 'our people'. Back to the main point, the poster TErikson did a great thing by forcing that Vicsim-propper Panamza to make his stance clear, and Vicsim-propper Panamza's stance is now confirmed: "The Victims Really Died in The Attacks Which My Videos Analyze, and deletion for comments stating otherwise." Good job TErikson. Thank you for posting your good work here. And, CitronBleu, your VISUAL screen-grabs (good quality, good moments, good comments added onto the screengrabs) are a pleasure to see. Very sharable visual evidence of the hoaxes, whoever the hoaxers in most cases might happen to be! Even though I got a little over-riled-up about a tiny sentence phrase, I still respect your many wonderful picture-says-a-thousand-words visual-contributions-which-prove-hoaxes on this page and others, CitronBleu. Last edited by Observer on Sat Nov 17, 2018 4:05 am, edited 1 time in total. It seems that we are all in agreement, but to be sure about this "Panamza", I will clarify a few points. Its role is intended for those who do not believe in the official basic version. He will comfort them in this "false flag" aspect to keep them in the idea that the attack is nevertheless very real with real victims. This kind of controlled opposition is quite classic as you know. As I mentioned on my own blog, Yitzhak Rabin's assassination is the most striking example. We could say to ourselves: "Panamza is just naive but he is honest". My answer is no. It is impossible, with all its articles since the Merah case, not to understand the scam of these attacks. But let's say so. Panamza never comments under his videos. But as soon as a guy talks about fake victims (me), he immediately removes them. No discussion about that! Of course for most people in the French alternative scene, Panamza is a great journalist who unmasks the official versions from the French government. Those who would talk about staging the attacks would be trolls paid by the government. Same kind as those who promote flat earth. The problem with Panamza is that although he shows the problems of the official versions, not admitting that everything is staged, there is always a form of wobbliness in his conclusions. Besides, he's a fiercely anti-Zionist Arab. Now, imagine the lamba guy, a nationalist who doesn't like foreigners. The attacks? Yes, it's an Arab move, there's no doubt about it. He's going to read the articles in Panamza. "Yeah, there are trouble spots, but I feel like the guy wants to do everything he can to exonorate of his Arab friends." 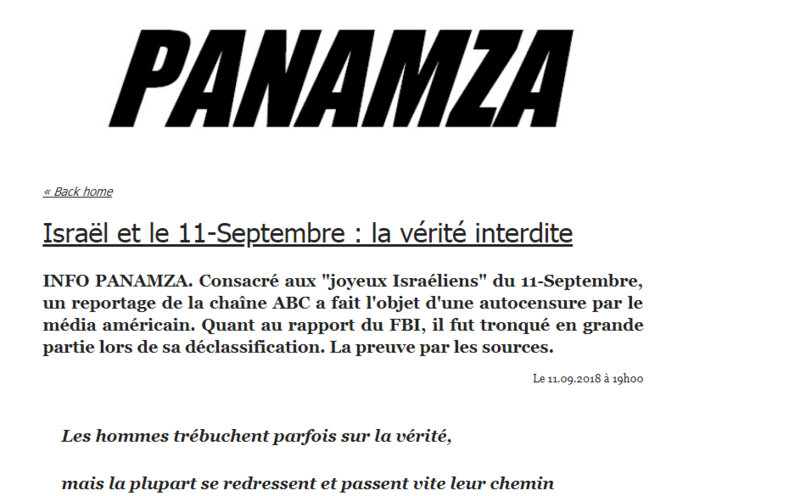 And Panamza implies the complicity of the French government but under Israeli command. As already mentioned above, even for September 11, he wrote long papers setting out the "proofs" that Israel is the greatest architect. Well, Panamza's role is to guide you on the fact that behind each attack, it is Israel (because it would be partly good for its interests). Do I really need to specify here why this is stupid and why it would involve far too many variables leading to a risk of failure and exposure? But above all, not admitting the hoax aspect is crucial. Because it would invite people to reflect on other events and wonder if everything would not be staged there too. And not just about the attacks. A large proportion of "awake" people see these attacks as sacrificial blood rituals. And they're comforted in there by all this numerology. With the word hoax in the title of an article, people don't even read for a second.